On published schedules of 12-step meetings, some are designated as open meetings, while others are shown as closed meetings. Open meetings are open to the public while closed meetings are for members only—however, each program's guidelines define who counts as a member. Alcoholics Anonymous, Al-Anon Family Groups, and Adult Children of Alcoholics meetings are generally closed meetings unless otherwise stated. Closed meetings are limited to members and prospective members only. Alcoholics Anonymous: The only requirement for A.A. membership is a desire to stop drinking. Al-Anon Family Groups: The only requirement for membership is that there be ​a problem of alcoholism in a relative or friend. 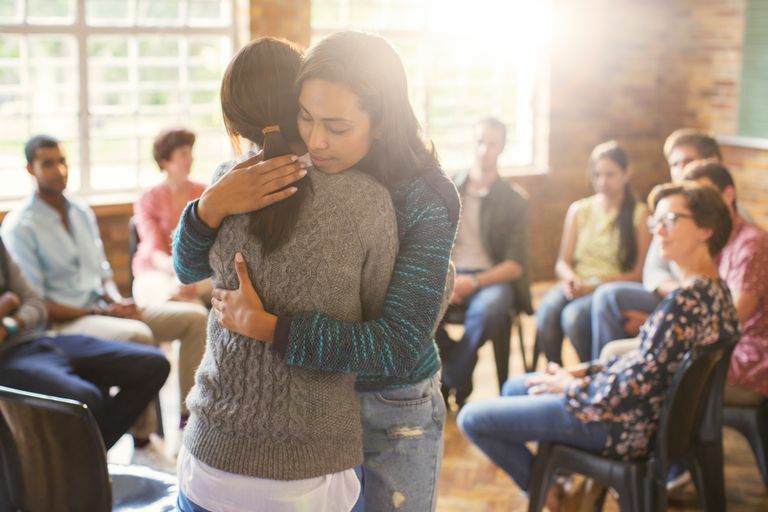 ACOA: The only requirement for membership in ACOA is a desire to recover from the effects of growing up in an alcoholic or otherwise dysfunctional family. Narcotics Anonymous: The only requirement for membership is a desire to stop using drugs. Gamblers Anonymous: The only requirement for Gamblers Anonymous membership is a desire to stop gambling. Debtors Anonymous: The only requirement for D.A. membership is a desire to stop incurring unsecured debt. The spiritual foundation of all 12-step groups is anonymity. Members of the group can choose to attend closed meetings knowing that everyone in the meeting is guided by the group's steps and traditions, which encourages each member to maintain their own anonymity and the anonymity of others in the meeting. In a closed meeting, members can speak openly and honestly about their problem or situation, knowing that everyone else in the room has experienced similar situations. If the meeting is an open meeting, however, members understand that there may be visitors from the public or even the media in the meeting and they conduct themselves accordingly. Usually, but not always, open meetings are speaker meetings, at which one person has been designated to speak, telling his story—what it was like, what happened, and what his life is like now. The speaker knows ahead of time that the meeting is an open meeting and there may be non-member visitors present. Open meetings are for anyone who is interested in learning more about the support group program. Open meetings can be attended by students, professionals, and other non-members interested in learning more about the recovery programs. The designation of a meeting as "open" does not change the meeting's primary purpose of the group. The primary purpose of Tradition 5 of the individual fellowships is to carry each group's message to the afflicted who still suffer. Generally speaking, when attending one 12-step meeting, members do not mention their membership in other 12-step groups during the meeting, to keep the meeting focused on its primary purpose. If a meeting is not designated either open or closed on a published schedule, it should be considered closed.